You are here: Home / Great Deals / Amazon Deals / 11 College Bound Dorm Study Necessities! If you have a college bound student it’s time to find the best deals to prepare them for the school year! 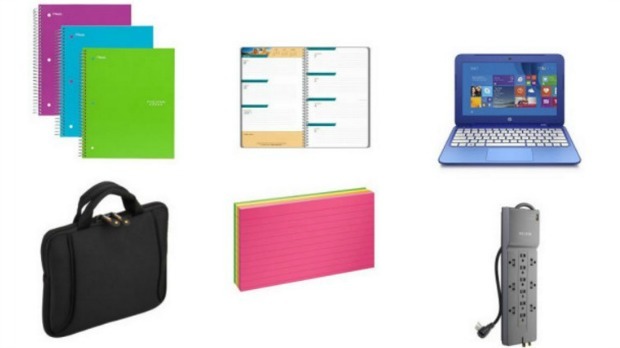 Check out these 12 College Bound Dorm Study Necessities! It’s a whole different ballgame than shopping for back to school in their early years, yet, it can still be much the same. You’re looking to fill a dorm room and make a great study place for them as well as their home away from home. You’ll still need, paper, pens, backpacks, notebooks, but you’ll also need sheets, towels, lamps, an alarm clock, etc. Don’t be overwhelmed, just get organized, do some smart shopping, start early and you’ll get it all done in good time and for less money! Sharpie Accent Retractable Highlighters, Assorted, Fine Point, 8/Pack Easy glide, versatile chisel tip is great for highlighting, underlining or writing notes. Just click and mark. The one-handed operation means there is no cap to remove or lose. Smear Guard ink is formulated to not smear over most inks (let air dry before highlighting). Color won’t fade type or bleed through most paper. Let ink dry before highlighting on written notes, faxes, copies, newspapers and more. Oxford Ruled Index Cards, 3″ x 5″ Size, Assorted Glow Colors, 300 per Pack (81300) Color code your study and presentation prep with assorted glow colors: pink, yellow, green, orange Ruled on one side, blank on reverse for easy note taking 3″ x 5″ size Paper made from 10% recycled fiber with 10% post-consumer fiber 300 per pack.